CAPE CANAVERAL — Culminating years of construction and testing, a $1.2 billion satellite designed to spot and track enemy missiles threatening the United States homeland, its deployed military forces abroad or allied nations will ascend to a surveillance post in space Thursday. A United Launch Alliance Atlas 5 rocket will boost the third Space Based Infrared System Geosynchronous Earth Orbit satellite, or SBIRS GEO Flight 3, to orbit from Cape Canaveral during a 40-minute window opening at 7:46 p.m. EST (0046 GMT). Kicking off another year, ULA plans at least 11 national security and science-enabling launches from the Cape and Vandenberg Air Force Base in California during 2017. And it all begins by launching a satellite to support one the U.S. military’s most critical missions — providing early warning of impending missile attacks. “This is a prime, important national security space launch and will continue the ability to do 24/7 missile warning for the nation and our allies,” said Col. Dennis Bythewood, director of the Remote Sensing Systems Directorate at the Air Force’s Space and Missile Systems Center. SBIRS evolves the orbital monitoring system from the Cold War focus on intercontinental ballistic missiles to today’s short-range missile threats by incorporating new technologies to make quicker detections of fainter objects. Spacecraft continuously monitor the globe to alert the national leadership and battlefield commanders of missile launches. The legacy Defense Support Program satellites have been joined by dedicated SBIRS birds in geosynchronous orbit 22,300 miles over the equator and SBIRS infrared sensors hosted aboard classified spy satellites in highly elliptical, highly inclined orbits observe the top of the world. “When the system was originally designed in a Cold War era, we were really worried about the Soviet Union and its allies (with) a relatively narrow profile of missiles and where we were looking at them coming from. In today’s world, certainly over the last 20 years, the proliferation of missiles outside that concentrated area has grown demonstrably,” Bythewood said. 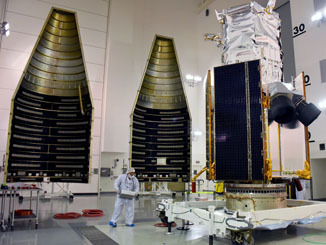 The first SBIRS GEO satellite was launched in May 2011 and the second went up in March 2013, both aboard Atlas 5 rockets from Cape Canaveral. They currently cover the globe from the eastern Atlantic, across Europe, through the Middle East, the Korean Peninsula and all the way to the western Pacific. The Air Force won’t identify exactly where this new satellite will be positioned, saying only that GEO 3 further expands the amount of globe covered with SBIRS-quality surveillance. “The addition of GEO 3 adds to the GEO 1 and 2 capability and provides a wider area of the Earth that we get that higher sensitivity to detect dimmer and shorter burning missiles,” Bythewood said. 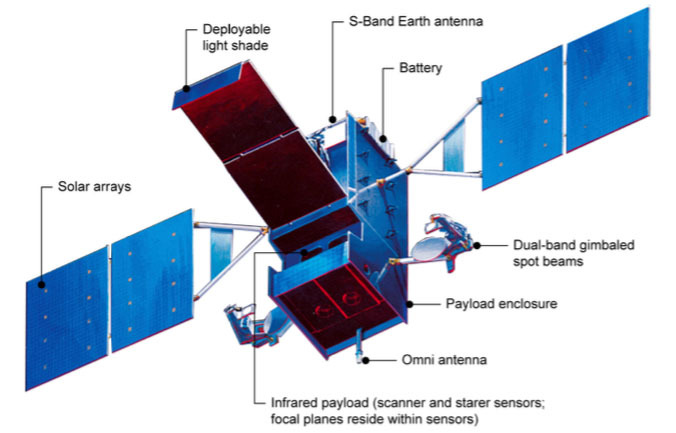 DSP have only windshield wiper-type scanning sensors, while the advanced SBIRS GEO spacecraft are equipped with both scanning and also staring instruments that can focus on specific target areas to increase the amount of reconnaissance that can be collected. 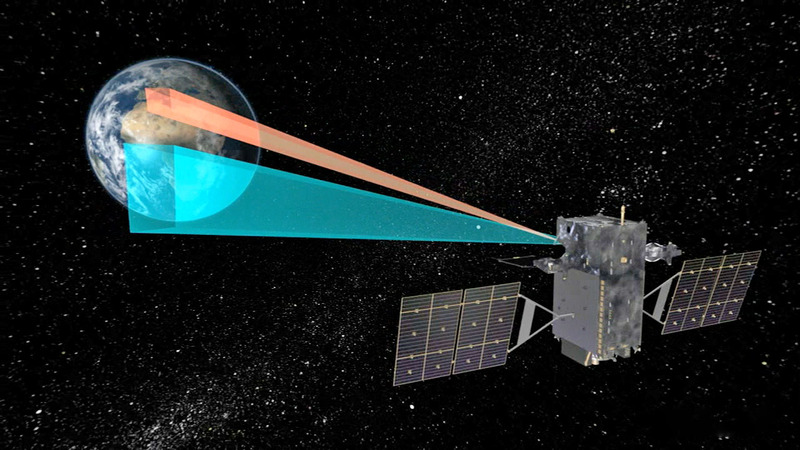 “The scanning sensor provides a wide-area surveillance of missile launches and natural phenomena across the Earth, while the staring sensor observes smaller areas of interest with superior sensitivity,” said Dave Sheridan, Lockheed Martin’s SBIRS program manager. SBIRS data tightens the U.S. military’s OODA loop — Observe, Orient, Decide and Act. It allows leaders to make decisions and take actions faster. 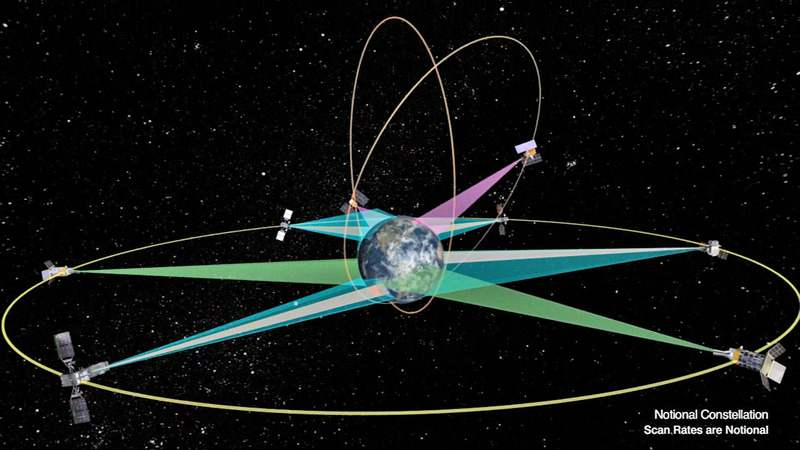 “The capability of the satellites we are launching now basically cuts in half the amount of time it takes for the satellite find and fix a missile launch on the face of the Earth and feed that into our missile warning network,” Bythewood said. 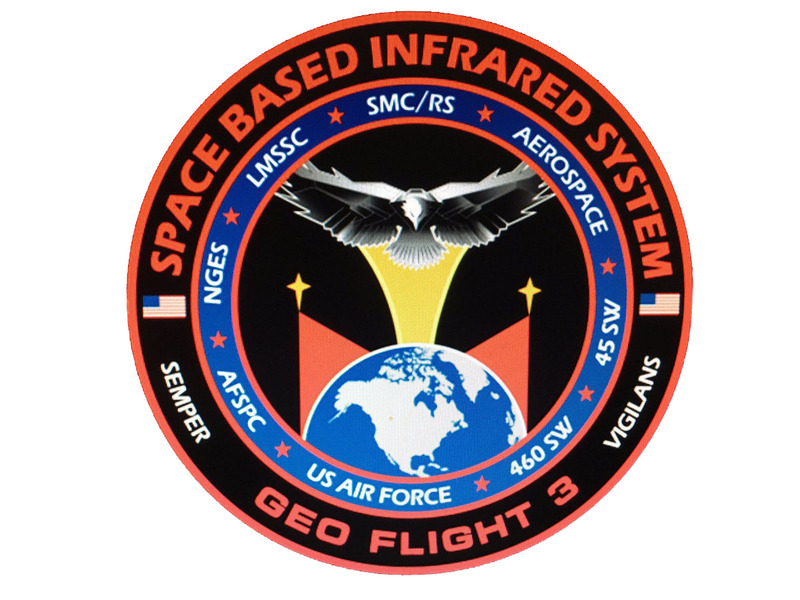 Approximately 8,000 infrared events are detected and addressed each year, including roughly 200 missile launches, according to the Air Force’s SBIRS ground controllers. And according to U.S. government intelligence, proliferation of ballistic missile systems, using advanced liquid- or solid-propellant propulsion technologies, are becoming more mobile, survivable, reliable, accurate and capable of striking targets over longer distances, the U.S. Missile Defense Agency says. “Over the last five years, the Missile Defense Agency has seen an increase of about 1,200 additional ballistic missiles, with 5,900 outside NATO, Russia and China, and hundreds of launchers and missiles are currently in range of our deployed forces,” Bythewood said. “Those trends we expect to continue, and the stress that puts on our mission area to provide timely and accurate missile warning data will grow as we move forward. 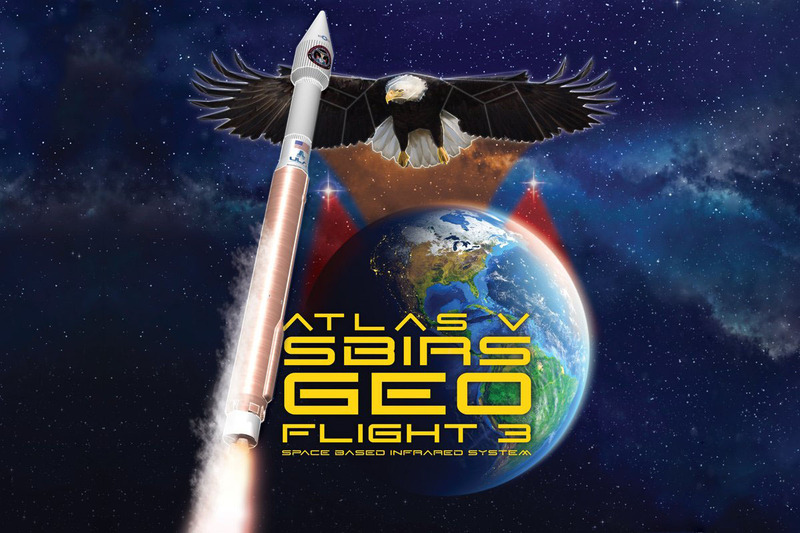 Weighing about 10,000 pounds at launch, the GEO Flight 3 satellite will be injected by the Atlas 5 into a standard geosynchronous transfer orbit with a high point of 22,237 statute miles, low point of 115 miles and inclination of 23.29 degrees to the equator. Separation of the spacecraft from the rocket occurs about 43 minutes after liftoff. From there, controllers will spend about 9 days performing 6 firings of the craft’s main engine to circularize the orbit before deploying the appendages and commencing the testing campaign. Built around Lockheed Martin’s commercial A2100 satellite platform, with a 12-year design life, the craft is a clone of the GEO 1 and 2. Their structures are made of lightweight, high-strength composite materials, and the birds are equipped with RH-32 radiation-hardened single board computers with reloadable flight software. “The GEO Flight 3 sensor suite was developed by Northrop Grumman and produced at their factory in Azusa, California, and then delivered to Lockheed Martin in Sunnyvale for integration with our spacecraft in September 2014,” Bythewood said. After deploying its pair of electricity-producing solar arrays for 2,800 watts of power, GEO 3 will have a wing span of 49 feet. The craft also extends a light shade for the payload and unfolds gimbaled communications antennas for secure, spot beam transmissions. “The GEO Flight 3 satellite is a functional equivalent of the on-orbit GEO satellites with minor design differences to account for parts and material obsolescence,” said Lt. Gen. Samuel Greaves, Space and Missile Systems Center commander and program executive officer for Space. This will be the 69th Atlas 5 rocket flight, the 34th to fly in the basic 401-configuration with no solid boosters and the 26th for the U.S. military. “SBIRS is considered one of the nation’s highest priority space programs, and we are honored to serve as the launch provider of this very important mission,” said Bob Winn, United Launch Alliance’s Air Force program manager. United Launch Alliance has four missions for the U.S. military, four for the National Reconnaissance Office, two for NASA and a commercial cargo run to the International Space Station scheduled in 2017. Seven flights will originate at Cape Canaveral and four will go from Vandenberg Air Force Base in California. Atlas 5 has eight flights slated, while the Delta 4 has two and the penultimate Delta 2 is planned. Following the SBIRS launch, another national security mission will occur from Vandenberg Air Force Base in California. 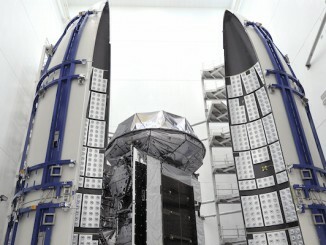 The Atlas 5 will boost the NROL-79 spy satellite payload into orbit in February. March has the Delta 4 launching the Air Force’s ninth Wideband Global SATCOM communications satellite, a craft built with funding from Canada, Denmark, the Netherlands, Luxembourg and New Zealand in an international partnership to share capacity of the constellation. And the OA-7 Cygnus resupply ship, operated by Orbital ATK, will head for the space station atop an Atlas 5. 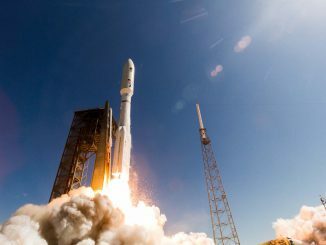 June features another Atlas 5 from Vandenberg launching the classified NROL-42 payload and a Cape deployment of the Air Force’s highly-secure Advanced Extra High Frequency 4 communications satellite by Atlas. Two Cape launches of Atlas 5s in August will carry NASA’s Tracking and Data Relay Satellite-M and the secretive NROL-52 bird. September tentatively has scheduled the next-to-last Delta 2 rocket with the civilian polar-orbiting JPSS 1 weather and climate satellite for NASA and NOAA from Vandenberg. October will see a Delta 4 fly from Vandenberg to put up the NROL-47 surveillance craft, and the fourth SBIRS GEO satellite launch atop an Atlas 5 from the Cape is slated for November. The Atlas 5 also has a few available slots that could be filled on short notice by commercial customers through ULA’s RapidLaunch and RocketBuilder initiatives.